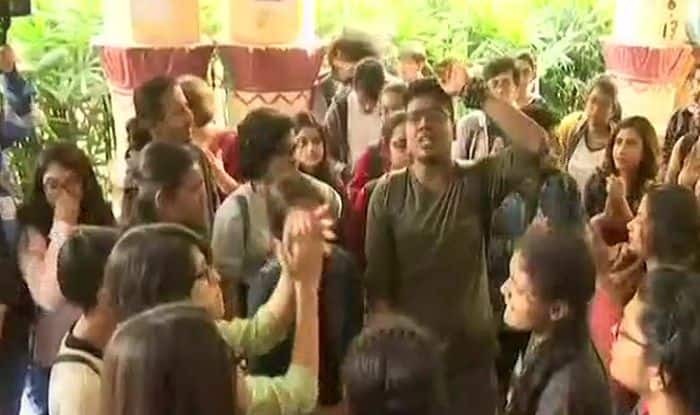 Kolkata: Students of Jadavpur University staged protest on Tuesday demanding expulsion of Prof. Kanak Sarkar over his recent sexist posts wherein he had equated a virgin girl to a sealed bottle. “We want his expulsion as he is influencing young minds and we don’t want misogynistic environment here. He’s a repeat offender,” students at Jadavpur University demanded. Earlier in the day, the National Commission for Women (NCW) took suo motu cognisance of the statements by a Sarkar. It was reported that the NCW team will meet the University’s Vice-Chancellor. The body has also written to the state DGP, directing him to investigate and take appropriate action as per the IPC. Jadavpur University Teachers’ Association (JUTA) had also condemned Sarkar’s statements. “JUTA unequivocally condemns the highly deplorable, misogynistic and sexist comments made by Kanak Sarkar of the IR department,” JUTA general secretary Partha Pratim Ray said in a statement. A couple of days ago, Kanak Sarkar’s Facebook post in which he likened a “virgin girl” to a “sealed bottle” had created outrage. “Are you willing to buy a broken seal while purchasing a bottle of cold drink or a packet of biscuits?” Sarkar, who teaches Political Science at Jadavpur University, wrote. “A girl is biologically sealed from birth until it is opened. A virgin girl means many things, values, culture, sexual hygiene. To most boys, virgin wife is like angel,” his post reportedly read.